Welcome to High Reach Systems. We are a furniture and construction external lifting company with offices in London and the South East. 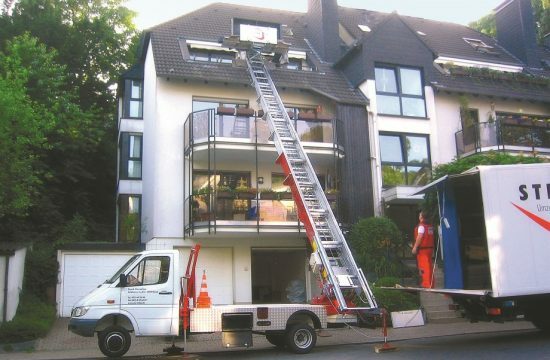 We offer a variety of external hoisting systems for elevating goods and furniture to height, in a quick, efficient and economic way. Working alongside individuals and companies, we assist with the movement of bulky or heavy items, both into and onto awkward spaces. Here in London, tall buildings dominate the urban landscape. From contemporary, inner-city developments and apartment buildings to office blocks and Regency townhouses, London has it all. While they form an impressive part of the city’s skyline, problems can arise when manoeuvring furniture and goods during removals, renovations and construction. That’s where High Reach Systems step in. With over 500 tall buildings in the pipeline to be built in London alone, with 115 already under construction, and with the potential to create over 100,000 homes at height, there has never been a greater need for an easy and efficient furniture hoisting company to serve the city. With three different hoisting and platform systems, we can raise heavy and bulky items of up to 400kg, to a height of 27-meters, in a matter of seconds. Our furniture hoist hire systems are reliable, safe and risk-free for you and your company as we provide the equipment along with fully trained and insured operators. On occasion, it may be necessary to remove door or window frames to ensure smooth access for larger items. Our expert operators are also fully-trained to replace, repair and make-good any alterations to ensure minimum disruption to you or your business. There is no need to dismantle larger items, such as corner sofas, as our platforms extend to 2700mm-1465mm. Even items which exceed these dimensions can still be loaded securely. Many Regency Buildings in London are Grade I or II listed and therefore protected, both inside and out. Internal stairwells and corridors can suffer damage when furniture is moved within them. Conversions have also created narrow hallways and doorways which are sometimes impossible to manoeuvre around. With a High Reach Systems furniture hoist, both the interior and exterior plasterwork of these historic buildings are protected. Precious items such as antiques or bulky white goods can be safely hoisted through windows avoiding damage from becoming stuck within tight hallways and stairwells. 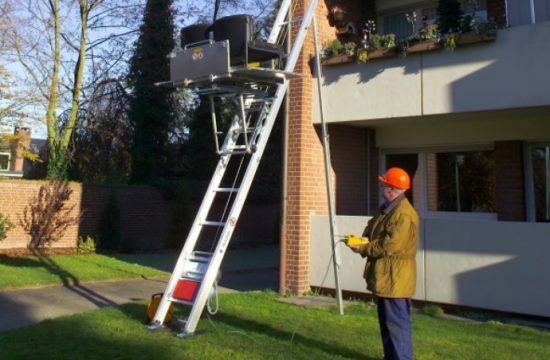 Using an external furniture hoist will also ensure the lift is kept free for other residents. We also provide furniture hoisting systems for self-hire. Our demountable self-hire hoisting systems are ideal for city environments where space is restricted. 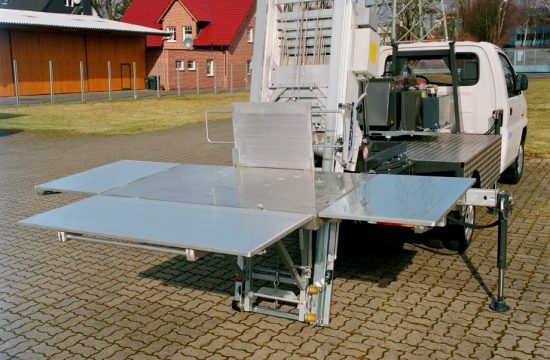 For use within narrow lanes and pavements, the portable and lightweight aluminium furniture hoist platforms can rise up to 18 meters, lifting weights of up to 250kg. Simplify an office move without causing obstructions and disruptions to your business or others’ within the building by using an external furniture hoist for the bulkier items of office equipment. 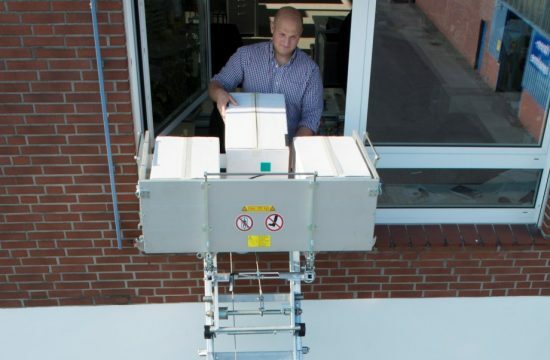 Photocopiers, office desk suites, technological systems and more can be hoisted to height within seconds to you floor so you can get back to business in no time at all. What began as a house removal solution soon evolved to support the construction industry. Loft insulation, pallets of wooden flooring and scaffold poles and planks can be hoisted to upper levels in less than a minute, freeing up manpower, significantly reducing labour costs, and maximising daily work output. What goes up, also comes down. 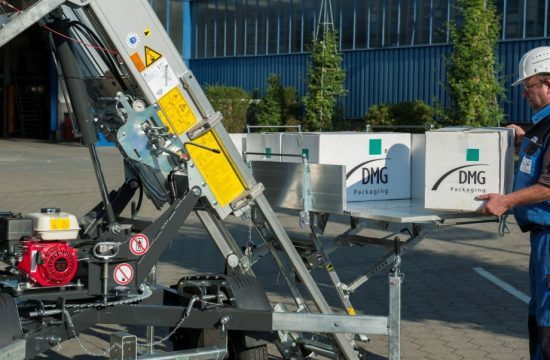 Removing and lowering waste goods from construction sites in a safe and ecological manner can also be achieved with the platform hoist which again reduces the risk of damage and debris left within the communal ways of tall buildings. Please contact us today to discuss your requirements. Whether you are looking to move a single item or several, we are happy to help.